When talented people write badly, it’s generally for one of two reasons: Either they’re blinded by an idea they feel compelled to prove of they’re driven by an emotion they must express. When talented people write well, it is generally for this reason: They’re moved by a desire to touch the audience. MEGAN: Good morning College Station! I’m Megan Dortch, and welcome to Write Right, the student podcast of the Texas A&M University Writing Center. As you know, Write Right is designed to provide useful tips and ideas in all areas of the writing process. These next two episodes will focus in on a specific grammatical concept–English articles and when to use them. If you’re a native English speaker, you’ve probably used the articles ‘a,’ ‘an,’ and ‘the’ correctly your whole life, without giving it a second thought. Their use comes naturally to you as part of your first language, so you never really needed to learn the rules behind them. But if you’re an English as a Second Language, or ESL student, you probably know that articles can be one of the trickiest grammatical concepts to learn. In that case, these podcasts aim to provide you with some concrete rules and examples of which articles are appropriate, and when. Articles can be defined as the part of speech used to indicate nouns and specify their application. They precede nouns in English and can be classified into 2 categories: the indefinite articles ‘a’ and ‘an,’ and the definite article ‘the.’ These categories have different functions, and in some cases, an article is not required at all. In this episode, we’ll look specifically at indefinite articles. An important concept to consider when using indefinite articles is whether or not the noun is countable. The Writing Center at Rensselaer University defines nouns as countable if they can be made plural, usually by adding ‘s,’ or another form of the plural ending. 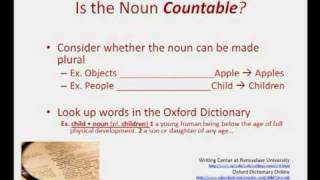 Examples of countable nouns are objects and people, such as ‘apple to apples,’ or ‘child to children.’ The Oxford Dictionary indicates whether or not nouns are countable, so you can look up specific words you’re unsure of. The English indefinite articles ‘a’ and ‘an’ are used with countable nouns in their singular form. For example, you say ‘a child’ and ‘an apple.’ Rensselaer points out that because ‘a’ and ‘an’ are derived from the word ‘one,’ they are not used with plural nouns, meaning, you don’t say ‘a children’ or ‘an apples.’ You can use modifying words like ‘some’ or ‘many’ to specify how many children or apples there are, but the fact that they’re plural means they can’t use the singular indefinite articles. Furthermore, there cannot be “one” of something that is uncountable, so you don’t use ‘a’ or ‘an’ with certain concepts, like love either.